Walking too fast (orig. Pouta) directed by Radim Spaček [CSFD, Eng-trans] screenplay by Ondřej Štindl played recently at the Gene Siskel Film Center here in Chicago as part of the 2012 New Czech Films Tour organized by the Czech Film Center and the Czech Consulates in Chicago and New York. (The tour promises to visit 8 major cities in the United States including New York, Los Angeles, Salt Lake City, San Francisco, Chicago, Portland, Washington D.C. and Seattle). Walking too fast (orig. 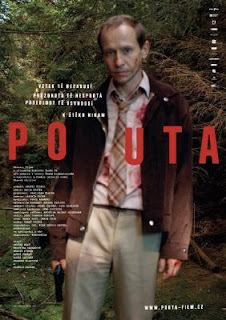 Pouta), a winner of three Czech Lions [CZ, Eng-Trans] (the Czech equivalent of the Academy Awards) is set in Czechoslovakia during the later part of the Communist era. The film is a study of the effect of power on even the individual police officers tasked with maintaining an authoritarian regime _and_ the limits of power in any case. Antonín (played by Ondřej Malý [CSFD, Eng-trans]) an ethnic Czech, who nonetheless had been born in the countryside prior to moving to the city (presumably Prague) is a member of the State Security Service, the StB [CZ, Eng-Trans]. Along with his Slovakian partner Martin (played by Lukaš Latinák [CSFD, Eng-Trans]) who thus was also presumably not from Prague but grew-up in the more rural eastern, Slovakian part of the country, are tasked with watching Tomáš (played by Martin Finger [CSFD, Eng-Trans]) a not particularly important dissident writer. It's rather boring work. Yet both Antonin and Martin certainly believe in the value/importance of what they are doing. They've been told by their higher-ups that they are doing this for the good of the working class / nation and they believe it. It all makes for a fascinating movie, and to be honest, as I've written this review, I've probably gotten more "into the head" of Antonin than I'm particularly comfortable with. 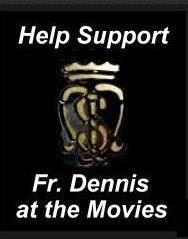 And truthfully, the film does not portray the moral life of the dissidents particularly well either. On the other hand, that's the beauty of freedom. In freedom, the hope is that one can truly tell a story that's truly painted in shades of grey. Nice review with interesting details that escaped me here in Norwich UK where WALKING TOO FAST finally played at Cinema City last night. I had difficulty in understanding Tomas (as you rightly pinpoint) and thought that Antonin was the most fully-realized character, so much so that he becomes a metaphor for the system: he is a risk to any citizen but he is also a threat to the system. The 2019 Academy Awards - Review: The year of the "Hollywood Spring"
(c) Fr. Dennis Kriz, OSM, all rights reserved. Awesome Inc. theme. Powered by Blogger.